The Carmichael Workshop: Making Drum Sticks on a Lathe! Making Drum Sticks on a Lathe! 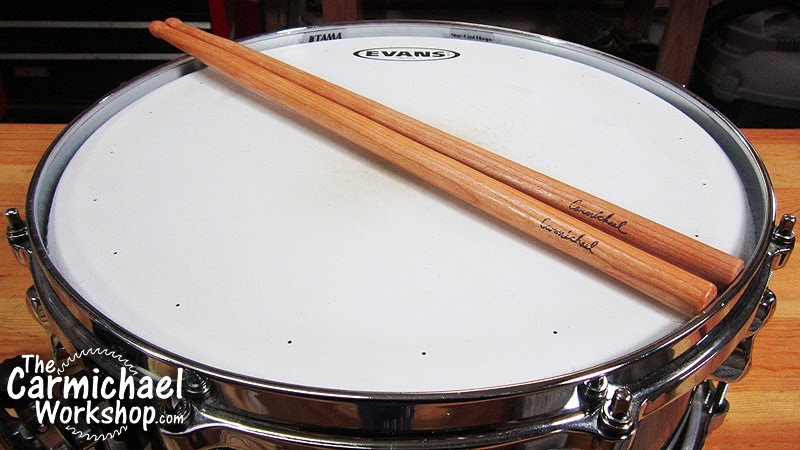 I've been playing drums since 1973 and I've broken lots of drum sticks. I'm new to the lathe and have turned many pens, so it was only natural to attempt to make my own drum sticks. I used solid cherry because it is somewhat durable, yet turns nicely on the lathe. I made my first one off-camera just to see how it would turn out. It was successful, so I recorded the process when turning the second one. The sticks are 16" long and about 1/2" thick. The sticks were easy to turn; however, the middle of the stick did flex from the pressure of the cutting tool. Next time, I might try using a steady rest to apply some opposing force to the tool. It was very rewarding to play drums with my own handmade sticks, so I will be making more in the future. Have you ever considered turning a set out of partition nylon! I use that same material for my "shop pens" and to make interchangeable, chuck mounted disc sanders for the lathe and it hold up pretty well to the abuse! Just a thought. Featured Site - Matt's Basement Workshop! The Woodworking Show Atlanta 2014!